We all know the story. The Titanic, a British passenger liner, struck an iceberg off Newfoundland on the night of April 14-15, 1912, and sank. There is part of that story, however, that is not widely known. The Titanic struck the iceberg at 11:40 p.m. on April 14, 1912. As the call was issued for passengers to vacate their cabins, Harper wrapped his daughter in a blanket, told her that she would see him again one day, and passed her to one of the crewmen. After watching her safely board one of the lifeboats, he removed his life jacket and gave it to one of the other passengers. One survivor distinctly remembered hearing him shout, "Women, children and the unsaved into the lifeboats!" Harper knew that believers were ready to die but the unsaved were not ready. Harper then ran along the decks pleading with people to turn to Christ, and with the ship sinking, he called upon the Titanic’s orchestra to play, "Nearer, my God, to Thee." Gathering people around him on deck, he then knelt down, and "with holy joy in his face" raised his arms in prayer. As the ship began to lurch, he jumped into the icy waters and swam frantically to all he could reach, beseeching them to turn to the Lord Jesus and be saved. Finally, as hypothermia set in, John Harper sank beneath the waters and passed into the Lord’s presence; he was 39. Apparently God wanted Webb's amazing testimony to be shared, because only seven people were plucked from the icy water that night to join the survivors in the lifeboats. Webb was one of them. In the Hollywood movie of the Titanic, nothing was said about John Harper, but he was truly one of the great heroes of the Titanic. In the face of death and drowning, he was concerned about the souls of men. 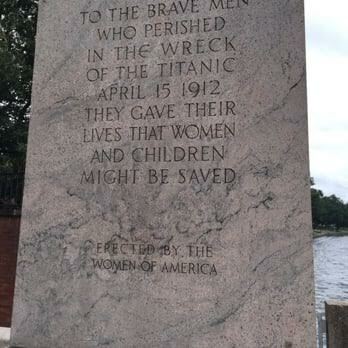 There were over 1,500 who perished in those icy waters that fateful night (1912). Of the women and children, 70% were saved (374 saved; 157 died). Of the men only 20% were saved (332 saved; 1360 died). Why did so many men die and so few women and children? That was a day when most acted like men. Captain Smith’s orders were to place women and children in lifeboats with just a few men chosen to be able rowers. The order was, "Men and women first!" To carry out this order required courage and sacrifice. The men acted in the spirit of love. They were willing to give of themselves and even sacrifice their own lives for the sake of others. It was not the survival of the fittest. The men made sure that the weakest survived. Captain Smith led the way and went down with the ship, along with more than thirteen hundred other brave men. "Watch ye, stand fast in the faith, quit ye like men (act like men), be strong, let all your things be done with charity (love)" (1 Cor. 16:13-14). One hundred years later (2012) another ship sank which was much larger than the Titanic. This was the Italian cruise vessel "Concordia." Thankfully only 32 lives were lost. In this case, the captain gave a far different order by his own example: "Every man for himself!" The captain himself abandoned ship leaving many still on board. He was later convicted of manslaughter. What a lesson! It was once, "Women and children first." Now it is "Me first!" Selfishness, not sacrifice, is the sad norm of our day. May we return to the Biblical norm: "Because He laid down His life for us: and we ought to lay down our lives for the brethren" (1 John 3:16). May God raise up such men! For a more complete study on this see the DVD entitled Act Like Men--A Titanic Lesson in Manliness (Biblical Worldview Media). When I heard of the Titanic disaster as a child I was told first and foremost that men had given up their places on lifeboats to women and children and gone to their deaths in acts of great gallantry. At the opening of the 20th Century there had been talk about the passing of the age of chivalry, but the figures for survivors of Titanic are still startling. If there are too many Astors and Guggenheims among the luxury passengers for your taste, let’s take second class. Some 81 percent of the women and children in second class survived as opposed to only ten percent of the men. In steerage where access to the boat deck was difficult, 47 percent of the women and children were saved as opposed to only 14 percent of the men. In first class among some of the world’s wealthiest people—exploiters of the poor and weak in Marxist analysis—94 percent of the women and children were saved, while their men drowned in the icy black waters of the North Atlantic. Two weeks after the Titanic sank, Nellie Taft, the President’s wife gave the first dollar toward a dollar-per-woman fund honoring the men of Titanic. The resulting monument is an 18-foot statue of a half-clad male posed on a 30-foot pedestal on which is engraved: "To the brave men of Titanic who gave their lives that women and children might be saved." It can still be seen in Washington across from East Potomac Park. These days no one visits it. —By Richard Grenier in the Washington Times, 2/13/98. The Titanic Memorial is a granite statue in southwest Washington, D.C., that honors the men who gave their lives so that women and children might be saved during the RMS Titanic disaster. 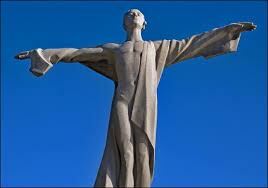 The thirteen-foot-tall figure is of a partly clad male figure with arms outstretched standing on a square base. The base is flanked by a square exedra, created by Henry Bacon, that encloses a small raised platform. 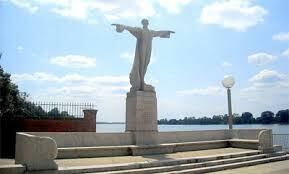 The statue was erected by the Women's Titanic Memorial Association. The memorial sits at Fourth and P Streets, SW, in Washington Channel Park next to the Washington Channel and Fort Lesley J. McNair. It was designed by Gertrude Vanderbilt Whitney, who won the commission in open competition, and sculpted by John Horrigan from a single piece of red granite furnished from Westerly, Rhode Island, by the Henry C. Smalley Granite Co. It was unveiled May 26, 1931, by Helen Herron Taft, the widow of President Taft.